Alaska's biggest caribou herd, one that has swelled and crashed over the past four decades, now is stirring conflict between state and federal managers over who should get to hunt the animals. The Federal Subsistence Board decided in April to close federal lands where the Western Arctic caribou herd is hunted — except to locals, those hunters federally qualified for subsistence. The yearlong closure to other caribou hunters would begin July 1. Most of the land in what the state calls Game Management Unit 23 — the Kotzebue area — is federal. Qualified subsistence hunters come from a larger area north of the Yukon River, from the North Slope to Nome. This week, the state pushed back. Officials are concerned about shutting out other Alaskans — including those with ties to the region — as well as hunters from Outside who may have already booked flights and hired a guide. Charters and guides could lose $1 million, the state says. Hundreds of hunters could be shut out, even though they take a much smaller portion of the herd than locals, state managers say. On Wednesday, Alaska Department of Fish and Game Commissioner Sam Cotten sent a letter asking the Federal Subsistence Board to reconsider the closure, saying the board was ignoring the very herd management plan it had endorsed in 2013. "Until this action, both boards (the Alaska Board of Game and the Federal Subsistence Board) used the plan for guidance when addressing controversial allocation decisions, " Cotten wrote. Subsistence board chairman Tim Towarak of Unalakleet declined to comment on the specifics of the state's request but said it won't trigger any redo. The federal board acted after getting a request for special action from the Northwest Arctic subsistence regional advisory council, a request made outside of the board's normal schedule. If the board acts on a special request, the decision is final, unlike with proposals handled within the normal cycle, federal managers said. "It's closed. There's not an appeal process. We can't go back and reconsider," Towarak said. Still, if the state puts in its own request for special action to allow a broad hunt, the matter could be considered anew, he said. That's likely the next step for Fish and Game, said Lem Butler, assistant director of the state Division of Wildlife Conservation. The state also could take the issue to court — though no one is talking about that at this point. The Western Arctic herd has been in decline, but may be stabilizing, Butler said. State and federal managers already have tightened the rules for hunting the herd, the state noted. For instance, the federal government in April lowered the daily limit for Alaska hunters from 15 to five caribou, to match the state. The herd has a huge range over some 157,000 square miles, bigger than Montana, from spring calving grounds on the northern foothills of the Brooks Range to summers along the North Slope to winters in the upper Koyukuk River drainage and along the Seward Peninsula. It's Alaska's biggest caribou herd and crosses paths with and absorbs parts of other Arctic herds. Testimony of residents, support of two regional advisory councils and "the current status of the herd" prompted the closure, the Federal Subsistence Board said in April. The action will ensure a subsistence priority for the caribou and give a preference to rural residents, the board said in April. "There was a perception of conflict between local and nonlocal users," said Gene Peltola Jr., who heads the U.S. Fish and Wildlife Service's office of subsistence management. In some 40 northern subsistence communities, lives and traditions were shaped by the availability of these caribou, according to the 2011 Western Arctic caribou herd management plan crafted by a working group made up of subsistence and sporthunters, reindeer herders, guides, transporters or charter outfits, and others. The plan anticipates conflicts and recommends ways to manage hunting, while ensuring the herd survives. "In an increasingly crowded world, many have come to think of caribou as symbols of undeveloped wild lands in the Alaskan North," the plan says. Caribou herds crash because of disease, competition for food, harsh or changing weather, predation, and overhunting. The Western Arctic herd numbered about 240,000 in 1970 before falling to 75,000 just six years later. It peaked at about 490,000 caribou in 2003, and has been in decline since, to an estimated 235,000 in 2013, the last time the state did a count off aerial photos. An attempted census last year was unsuccessful because of wildfire smoke and unusual caribou movement. The state intends to try an aerial survey again this year. 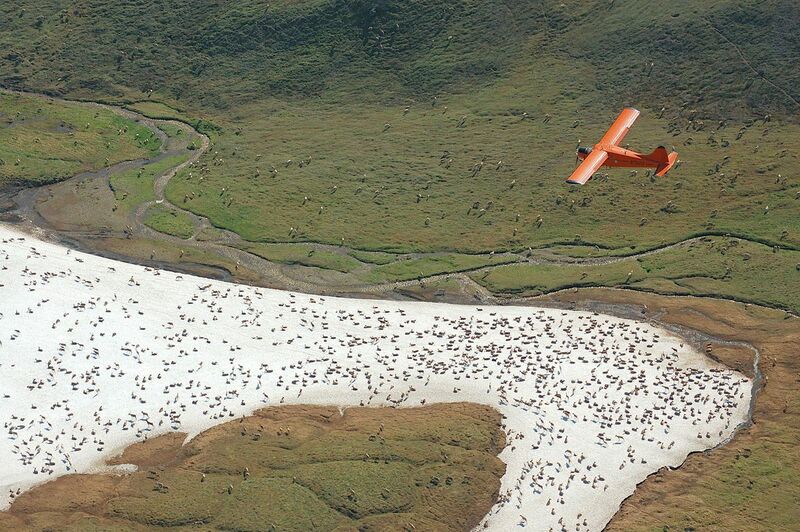 In April, state biologists told the federal board they estimated the herd numbered between 200,000 to 235,000 animals. The lower population would justify more restrictive management, under the Western Arctic herd management plan. But state biologists say they have reassessed the numbers and now estimate the herd's minimum size at 206,000, a population that needs conservative management under the plan, but not the "preservative" management that can include closing the hunt to nonlocals. "We knew the herd was declining but we are starting to see evidence that it wasn't declining as fast as it was seven or eight years ago," Butler said. Biologists factored into their model additional information, including last winter's good survival rates of calves and cows, some of which are tracked with radio collars. In addition, caribou assessed in the fall when they swam across Onion Portage showed improved health over caribou in prior years. During that part of the fall migration, some caribou are caught and collared, and biologists also check their weight, collect samples and check their body fat index. On average the cows examined last year were considered "fat" and none were "skinny" or "very skinny," unlike in past years, biologists found. Calves averaged 100 pounds, the heaviest in the eight years the state has been weighing them, according to information state biologists compiled for the reconsideration request. The herd is large enough to sustain an annual hunt of 14,000 to 18,550 caribou, state biologists say. As it is, about 12,000 are harvested a year, just 600 or so of them by hunters outside the region who would be barred under a subsistence-only hunt, Butler said. About half of the nonlocals aren't Alaskans and those hunters are limited to a single bull during a short Aug. 1 to Sept. 30 season. Under current rules, Alaskans can kill five caribou a day, with seasons for both bulls and cows; calves cannot be taken. Hunters are encouraged to limit their take of cows. About 1,500 subsistence hunters who travel by boat in summer and fall and snowmachine in winter account for most of the harvest, said Brandon Saito, the Kotzebue-based area management biologist for the state. Those from outside the region usually are dropped off by plane. The boost to the region spills beyond the direct benefit to guides and charters. Stores, restaurants, hotels and fuel suppliers all get a benefit, the state says. Some number of those nonlocals are originally from the area and return to fill their freezers, as they have much of their life.